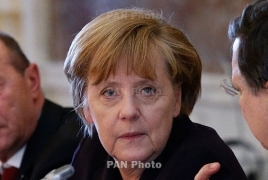 PanARMENIAN.Net - German Chancellor Angela Merkel stands by her view that European sanctions against Russia can only be unwound once Moscow fully implements the Minsk peace deal for eastern Ukraine, her spokesman said on Monday, June 20, according to Reuters. "The sanctions can be removed as soon as Russia fulfills these obligations," spokesman Steffen Seibert told a regular government news conference, reiterating the stance agreed at a meeting of the Group of Seven economic powers last month. "However, we are ready to take further restrictive measures to increase the costs for Russia, should its actions make this necessary," he added. German Foreign Minister Frank-Walter Steinmeier was quoted on Sunday as saying the European Union should gradually phase out sanctions imposed against Russia over the Ukraine crisis if there is substantial progress in the peace process.